Most people learn about sin either through the religion their family teaches and raises them with or though literature, movies, tv, or art. We learn there are seven original sins: lust, greed, gluttony, sloth, wrath, avarice, and pride. On one hand, we learn that sins are bad, negative, not to be done. Yet for some, the warnings we’re given aren’t deterrents for committing sins. In Dante’s Divine Comedy, the first part explores the nine levels of Hell or Inferno. This September’s round of Twisted Hunt is inspired by Dante’s Inferno. 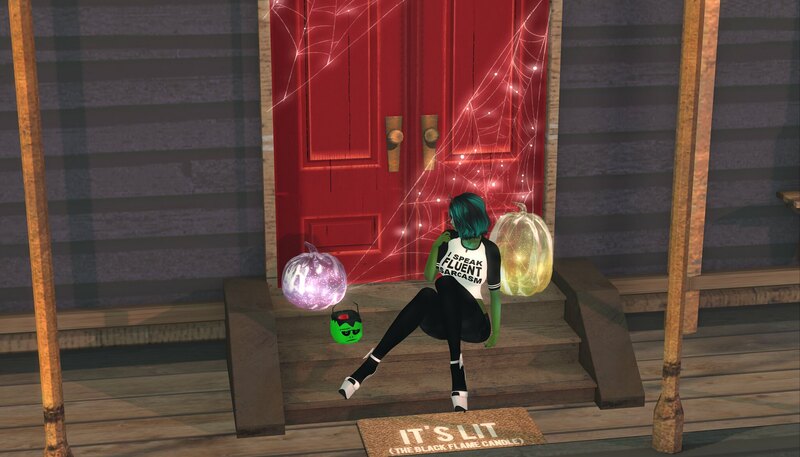 If you haven’t heard of Twisted Hunt, it is a grid wide hunt in Secondlife that is completely free and rightfully claimed to be the hardest hunt on the grid. I’ve completed quite a few of these hunts that happen every March and September, and yes, they are the hardest hunts I’ve done in sl. But the trade off is that you get some fantastic gifts from the participating merchants. If you don’t mind working hard for some cool stuff, check out a couple of things I’ve already swiped on the hunt. So my friends at =EC Designs=, Mishmash Fusion, and ~MystRie~ all collaborated on another side hunt for Twisted Hunt. Like their side hunt for Twisted Hunt Atlantis in March, you must travel through multiple levels, finding a prize and the correct teleport object. This time though, you must venture much like Dante, through the nine levels of Hell. If you aren’t feeling the heat in the side hunt, it’s not required, although you do get to see the main prize from =EC Designs= at the end. The final level of Hell features a frozen lake, skulls, and well… a lot of bad juju from the worst sinners. The actual prize from =EC Designs= is a frozen lake with trees around it that you can sit on with friends or a loved one or use some of the ropes to “hang out” on. It’s a bit creepy and spooky, and perfect for Halloween season. There are a TON of pose options for couples and singles, even a spot for petite avatars! Hunt for this prize in the =EC Designs= shop. Also out in the shop are some gachas to play, one of which are skates to use on your new lake from Hell. Unrigged, the Hellskates should work for most human avatars. if you wear a mesh body, you should only need to detach or hide your feet. Classic avatars can adjust the height of the skate to suit. Collect all of the skates and show off your skating skills on your new lake! To match the Hellskates, Mishmash Fusion also has a gacha with ice skating dresses out. Sorry gents, no outfits for you, but the hunt prize has a nice suit for both women and men! The Hellskater Outfits match each of the Hellskates so you can have a complete set if you get a matching pair OR you can buy the fatpack and have them all. Sizes for the outfit are modeled for Belleza, Slink, Maitreya, eBody, and Tonic mesh bodies. Find this and another dress gacha in Mishmash Fusion’s mainstore while you’re hunting for their prize cube! Spring has sprung, showing her face here and there at last. With more sun, blooms peeking out, and birds chirping in the early hours again, there is a renewed sense of hope for brighter days ahead of us. Part of the season change, for me, is refreshing my look, cleaning out the old tired clothes, and finding new pieces that call to me. If I can find them on sale, even better! Today I am sharing some of the cute things for sale at the Cart Sale at the Wash that has been dubbed Sunny Side Up. The dress that I’m wearing is from one of my favorite shops, Mishmash Fusion, and is called Imagine. Each color or pattern option comes with 8 different mesh models which are fitted for Slinks Physique and Hourglass, Bellezas Freya, Isis, and Venus; Maitreya Lara, eBody, and classic avatar standard fit bodies. The fit on my Maitreya Lara body is nice and the dress is sweet and cute. If you don’t want to show as much skin, you could wear some leggings underneath. For 10L, this dress is a bargain! I’ve paired this dress with a pair of cute heels in violet from the Dark Fae which are also at the Cart Sale. The Delicate Rose heels are available in 9 colors and fitted for Belleza, Slink, and Maitreya mesh high feet. While there is not a fatpack option, if you get every pair, that’s only 90L and a steal in my opinion. Wear these heels with a pair of jeans to be cute and casual or wear them with a dress like I did for a nice afternoon out. Around me you will see various decor on the wall that is from Dark Knight Decor. These pieces are perfect for a kitchen, bathroom, office space, or workshop to add a touch of spring. Little details on each piece add to their charm like the woodgrain on the plank or the shine on the seed jars. Each of these pieces and more cute knick knacks and flower arrangements are up for grabs for 10L apiece at the Cart Sale. My last item for this post is the shark which is from =EC Designs= and is one of two on sale for a limited time. After the Cart Sale, both will be put in a gacha at the =EC Design= mainstore with a bunch of other cute sharks. Each shark has a ton of single sits for females and males. Whether you are a parent, kid, or just like sharks, you don’t want to miss out on these amazing items! Toss a few of these out in a casual sitting area for a bunch of friends and just chill out or throw some out for your kids to have pirate battles with.